The perception of which countries wield the most influence on the international stage can be in the eye of the beholder. People around the world largely agree that China has become more important over the past 10 years and are more mixed about the roles that Russia, India, Germany, France, the United Kingdom and the United States play. But people in Russia, India and Germany stand out for being much more likely to say their country is playing a bigger role in world affairs than are people in other countries, according to a Pew Research Center survey. For example, 72% of Russians say their country is playing a more important role in the world today than it did a decade ago. This compares with a median of 42% across the 25 other countries surveyed. Indians and Germans are similarly rosy-eyed about their own countries, while global evaluations are much more circumscribed. A variety of factors may be behind how people feel about their own country’s rising or falling importance on the global stage. How people feel about their country’s current economic situation contributes to their opinions of their country’s general importance in the world over the past decade. People who think their country’s economy is doing well now are more likely to say their country is playing a larger role internationally than it did in the past. Conversely, people who think their economy is doing poorly are more likely to see their country as a declining power, or, at best, maintaining its status quo. Taking India as an example, two-thirds of those who think the economy is doing well think the country is playing a more important more in global affairs, compared with around half of those who think the economy is doing poorly. What’s striking in some countries is the role partisanship plays in evaluations of a country’s growing or diminishing prominence on the world stage. In the U.S., for example, 45% of Republicans and Republican-leaning independents say the U.S. plays a more important role as a world leader today than in the past – a marked change from 2016, when just 15% said this. Views among Democrats have moved in the opposite direction following the change of administration. Only around one-in-five (19%) think the U.S. plays a more important leadership role today than it did 10 years ago, down from 27% in 2016. About half of Democrats and Democratic leaners (49%) now say the U.S. plays a less important role today than in the past; in 2016, just 29% said this. In the UK, people who have favorable views of the Labour Party (42%) or Liberal Democrats (40%) are more likely to say that the UK has declined in importance than those who have positive views of the Conservatives (27%) or far-right UKIP (25%). This sense of decline has increased among Labour supporters since 2016, prior to the Brexit vote. In contrast, those who have a favorable opinion of UKIP – the group which largely helped to spearhead the Brexit vote – are much less likely to see the country in decline now than they were in 2016 (25%, down from 46%). In India, people with a favorable view of the ruling BJP are slightly more likely to say their country’s global stature has increased (64%) than those with favorable views of the Congress Party (58%). Partisan differences are more muted in Germany, France and Russia. Education plays different roles, depending on the country. In European countries and the United States, more educated people are less likely to say their countries have grown in importance over the past decade. For example, 22% of college-educated Americans say America plays a more important role today than it did 10 years ago, compared with 34% of those with less than a bachelor’s degree. But, in India, more-educated people are more likely to say their country has become more influential over the past 10 years (though people with less education are much more likely to say they don’t know). Age also tends to influence how people feel about their country’s current position in the world relative to the recent past. But, whereas older people tend to see their countries more in decline in the UK, France and the U.S., the opposite is true in Germany and India. For example, 45% of those 50 and older in the UK think their country has lost influence over the past 10 years, compared with 35% of those under 30. 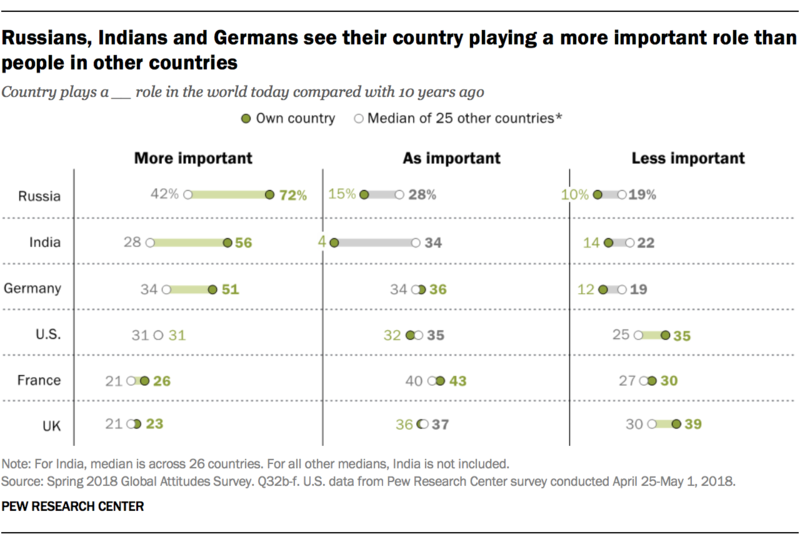 In Germany, 64% of those under the age of 30 say their country’s influence has grown over the past decade, compared with 51% of those 50 and older. Correction (Jan. 4, 2019): This post and its first chart have been corrected to reflect a revised weight for Australia in 2018. The revised 25-country median viewing Russia as more important compared with 10 years ago is 42%.